For students of investing, one of the first principles taught is that commerce occurs in cycles, much like the ebbs and flows of waves in nature. The demarcations of these business cycles are typically recessionary periods, a time for consolidation and regrouping in order to recover and begin the next positive wave. No matter what the prevailing trend might be in the cycle, various market sectors are known to historically perform better than others, providing opportunities in both bear and bull market periods. Understanding these business “seasons” and how to recognize related investment opportunities is commonly referred to as seasonal investing. The positioning of various sectors is based on a study of years of historical data and should not be construed to mean that this representation will always hold. Past performance is never a guarantee of future results, but from a pure probability perspective, there is enough consistency in the above pattern that “seasonal” investors have taken advantage of these relationships and profited in the process. 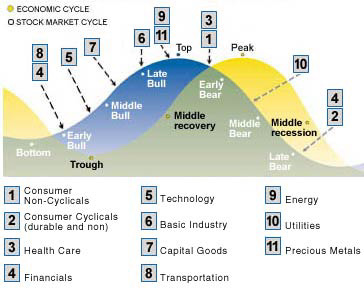 The first “takeaway” from the diagram is that the stock market generally precedes actual results in the business cycle. Analysts have estimated that the markets anticipate results six months down the road and factor those results into today’s valuations. On the chart, this timing difference is represented by the difference between the “Top” of the “blue” stock market cycle and the “Peak” of the “gold” business cycle. The current recession ended last year, but the “trough” has been extended while a mild recovery has gradually developed. However, there has been a mild bull market for the past seven months, driven primarily by government stimulus programs. There is still doubt if our recovery will stabilize once the Fed discontinues its Quantitative Easing program in June, but currently, the market appears to be optimistic. As mild as our recovery has been, initial attention last year focused on UPS and Fed-Ex. Transportation stocks signal that commerce is moving again. Increases in transactions are confirmation that favorable trends are imminent. Banking stocks typically move early also, reflecting more financial support for business growth, but in the current case, banks are more the exception than the rule due to persisting problems with foreclosures in the real estate industry. Technology and basic industry are next in line and have shown appreciation in the recent run-up in stock values. Seasonal investors need not focus only on domestic offerings. Today’s investor must be global in perspective since much of the growth in global commerce has been in emerging market countries. Overseas investing does involve more risk, as anyone engaged in forex trading would advise. Gains in a foreign company can be wiped out if the Dollar appreciated materially versus the other company’s currency. A forex broker can provide hedging tools, but hedging is not for the inexperienced. The best way to invest “seasonally” and in markets overseas is by way of the many exchange-traded fund offerings on the market. One can easily construct a well-diversified portfolio of shares from a variety of funds devoted to investing in specific market sectors. If an individual stock appeals to you, then that can also be added to the mix. Seasonal investing benefits from the business cycle’s “rollercoaster” ride. Use these principles to get the most out of your ride. What motivates your finances? What is the purpose that drives you to reduce your debt and make more money? For me, the one thing that keeps coming back when I ask myself those same questions is the idea of freedom. The start of my own personal finance revolution started with some realizations. I realized that the financial path I was on wasn’t getting me anywhere else but broke. I wasn’t going to hit the lottery or discover some miracle money maker that would make me a millionaire. But, that isn’t my purpose. It’s merely the keystone that sparked my current journey. When I began my journey, I decided that I needed to learn how to handle my finances. The one name that kept reappearing in my reading was Dave Ramsey and his “Total Money Makeover” book. So, I bought it and read it. And, something he said in that book brought my true motivational factor to the front. Yes, I wanted to have less debt and make more money. But, what I really wanted, was freedom. He spoke about being debt free and having the freedom to tell your boss to “take this job and shove it.” What a thought. So many of us have to go to work every day to make enough money to pay our bills. But, what if we minimized those bills and had the freedom to do whatever we wanted to do to make money? That is what motivates me to remove myself from the debt treadmill, and join the select few who have the freedom to pick up and do something that they enjoy! What a freedom! What about you? What really motivates you to become debt free?